The Church of Assumption/St. Paul was built in the Gothic Revival style, between 1912 and 1917. The interior of the church remained simple white plaster until 1941-47, when it was redecorated with the addition of paintings of various saints, stenciling on the walls and polychrome painting of the ribbed, molded plaster ceiling. 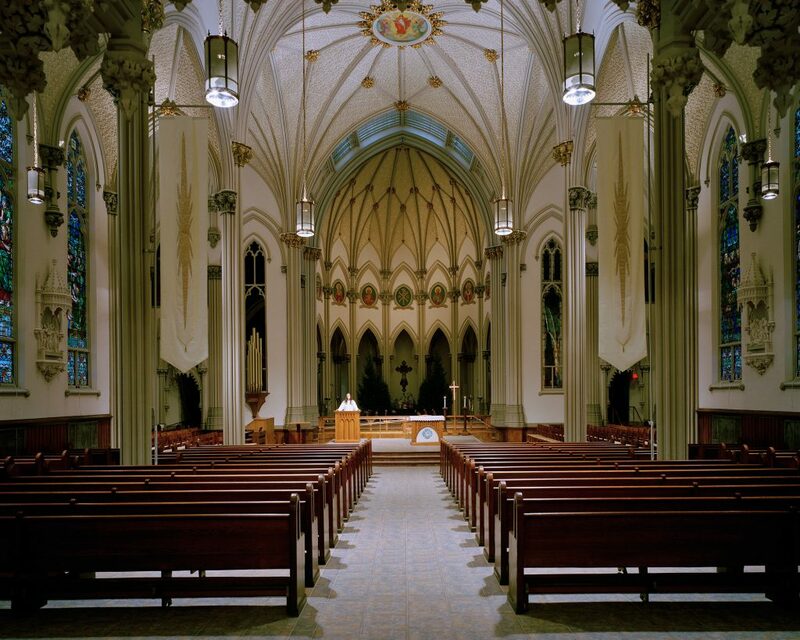 The renovation of 1999 was inspired by Environment & Art in Catholic Worship, and here I will use some headings of that document to describe the work. 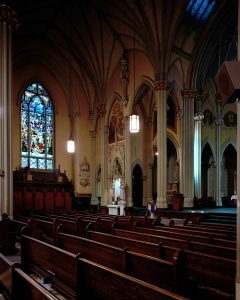 Careful consideration was given to the traditions of this parish, so that they would be respected through a sensitive renovation of their historic home while providing an appropriate environment for the renewed liturgy. The reuse of removed building materials and artifacts was also given high priority. The altar has been brought into the center of the crossing so that it is closer to the people. Through reconfiguration of the seating, a large open area has been created around the new font location to be used as a Gathering Area before and after Mass. A small prayer garden space was also created at the new entrance. Some of the existing pews have been reused, but they are spaced farther apart. The use of chairs offers some flexibility of arrangement. Better access has been provided through the development of a new main entrance with access ramps instead of a wheelchair lift. All spaces within the building are now accessible to people with mobility impairments. A completely new lighting and control system increases the visibility of the liturgical action and the written word for all. Finally, the toilet facilities have been made more accessible and diaper-changing tables included. The original monochromatic paint scheme has been restored, creating an environment that invites contemplation rather than drawing attention to itself. The new lighting system allows for a variety of foci for various uses of the space and various rites. Lighting before Mass is focused on the architecture and the artwork. During Mass, these areas are dimmed and light is focused on the liturgical action. 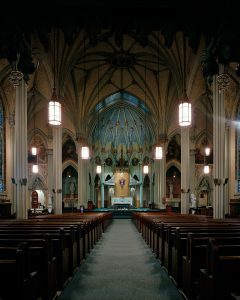 The interior of the church before the 1997 renovation, showing the changes made soon after Vatican II. The scale and decoration of the existing space had a tendency to distract from the ritual action rather than enhance it: It was very busy, with a mix of colors and images that overwhelmed. 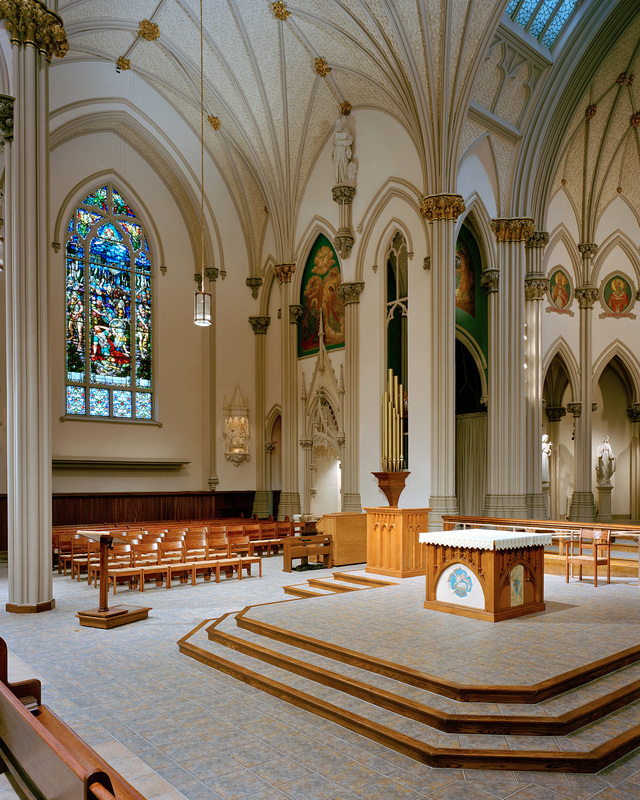 Rearrangement of the space and appropriate lighting maintains the architectural quality of the space yet focuses attention on the liturgical action at the appropriate times. The design of the new furnishings conserves the Gothic Revival aesthetic without mimicking of historical examples. The new tile floor is contemporary, yet seems as though it has always been there. A new altar, fabricated from marble from the 1940’s altar and woodwork from the old confessionals, is centrally located, but slightly off axis to give equal importance to the ambo. Parts from the three oldest side altars were used in new devotional spaces. The new ambo was constructed of tracery from old doors of the church. It includes a fold down step to accommodate the readers of smaller stature, including children. The original baptismal font has been incorporated into a new step-in font, designed and constructed by parishioners. The new tile flooring in the church includes a special pattern at the font area, further defining this area as a baptismal area. The renovation opens up the architectural form of the apse. A new processional cross was created using parts of the old communion rail. New candlesticks were fashioned from parts salvaged from the old confessionals. New seasonal banners were custom-designed for the space and installed on new, freestanding banner poles. The current configuration of the place for liturgy is much more effective in serving the full, conscious and active participation of the assembly as a whole, and within the assembly, of the various ministries. Rearrangement of the seating and the Music Ministry, improved lighting and sound systems and the central placement of altar and ambo help bring the people close together. Visibility and audibility are enhanced, but so too is the bodily sense of being “gathered together in one place” as the Acts of the Apostles describes the early church (see Chapter 2). The altar of Christ’s sacrificial meal is clearly the focus here. The space for the Children’s Liturgy of the Word was enlarged and renovated to be more appropriate for the children’s use. In addition to the access improvements mentioned above, an assistive listening system was installed to allow people with hearing impairments to participate fully in the liturgy. Click on the thumbnails for Before and After Floor Plans. The tabernacle has been relocated from a side altar to a new private chapel. A new tabernacle was constructed from one of several old tabernacles in the building since the 1940’s, specifically the one enclosed in woodwork in the old reredos that was removed. A new art glass window designed specifically for this chapel helps integrate the chapel into the main body of the nave. A new, more appropriately located space has been provided for the Sacrament of Reconciliation in the base of the bell tower. This tower had previously housed the stairs to the balcony, which is now closed to the public. Statues from around the church were relocated to the apse to create a Communion of Saints behind the altar platform. All painted and sculptural images from the original interior were retained. Bas-reliefs that had been behind side altars were placed in the new entry and in a new shrine area in the former baptistry. 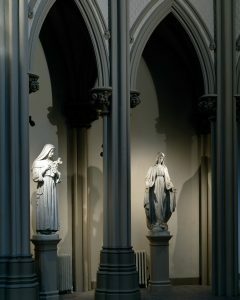 Statues that were once located on altars were relocated in the small apses that ring the original sanctuary, where they are available for private devotion and also join the gathered assembly by metaphorically completing the circle, giving witness to the communion of saints. This article was originally published in the May 2000 issue of Environmental & Art Letter. 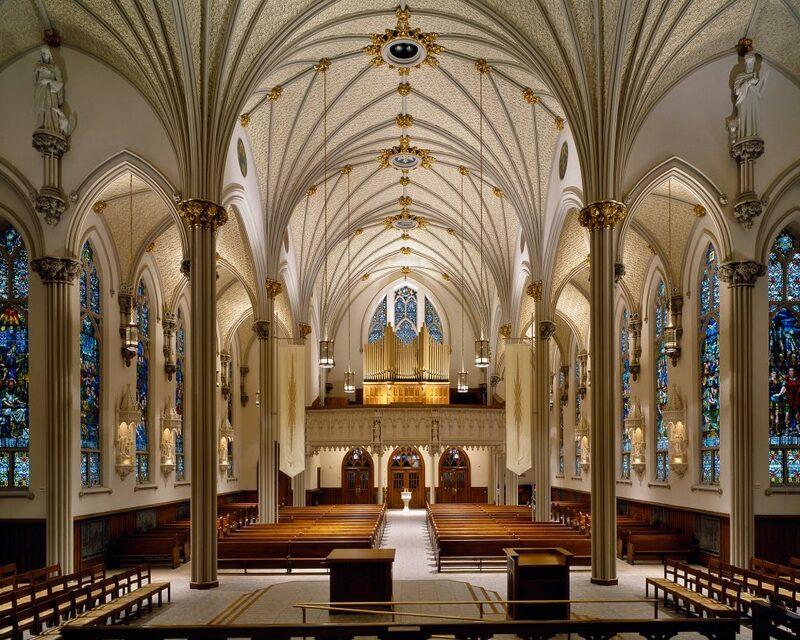 Design by James Hundt with Liturgical Design Consultant Richard S. Vosko. All photographs are by Randall Perry Photography.